Due to the inclement weather the waterpark will not be opening today, Saturday June 6. 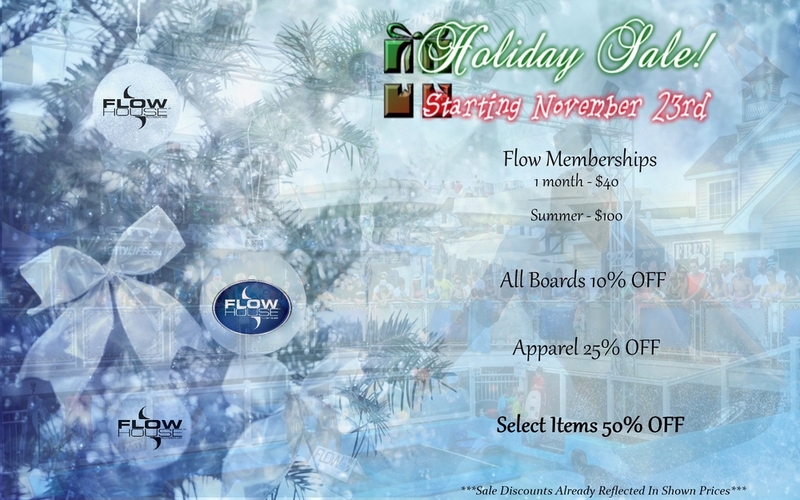 Please call (609)492-4200 after 3pm to see if the Flow House will be open this evening. Thank you and we apologize for any inconvenience. Visit our ONLINE STORE to save on your 2015 season membership. Normally $120 on sale now for $75. 2015 Memberships are on sale $35 for a month or $75 for the season. Memberships get you 40% off all stand up sessions and 10% off in store apparel and merchandise. All tshirts are on sale for $10. Remaining WCB bodyboards are on sale for $150. The private wave rentals can be other hours on any of those days to accommodate riders but we need advanced notice to schedule our staff. Join us Thursday, August 7 from 7-11pm to help raise money for HLH in memory of Mikey DiBernardo. $40 to ride the wave all night. A portion of every riding fee as well as 100% of donations will be donated to the HLH Foundation to help with further research of the disease. There is no admission fee for spectators, though donations are appreciated, so come listen to some live music and watch everyone out on the wave. Hope to see everyone here. Flow House Thundering Surf is scheduled to host the 2014 FLOW Tour Prime Event series on July 13th featuring the bestflowboarders in North America! Come by and check out all the action as riders will be competing for Tour points, prizes and cash money! • Our day sessions (9am-7pm) are strictly body boarding, which is included with the park. If a special competitor lodging package is created and offered it will be advertised here. Private Wave rental is available July 10 and 11, only 10pm-2am. Normally we charge $450, but for the tour we are charging $300. Earlier hours must book first before later hours. We will be opening Saturday, April 19th noon-5pm!! See you there! Flow House Thundering Surf is now closed for the season. Thank you to all that came out this year and proved LBI was still standing strong after Hurricane Sandy. We were very lucky to be able to recover and prepare in time for the 2013 season and were thrilled to host the 2013 US FLOW Tour finals on Labor Day weekend. This season will not be forgotten and we hope to see everyone back next year! Show Boarders how you live the Flow Life and win a spot in their new movie! ATTENTION all FLOW Tour competitors, parents, spectators, and sponsors. Please download, print, scan or fax your registration forms for Flow House Thundering Surf FLOW Tour Finals ASAP! Please e-mail DanSprague@FlowHouseLBI.com your completed entry form. With the tour entering the second half and nearing Finals here is a list of hotels/motels in the surrounding area of the Flow House. Or, if a bunch of you are looking to make it a week long event the numbers for 2 friends of the Flow House are listed as well for weekly rentals. Either way be sure to check them out soon and secure your accommodations before they are all booked. Sorry everyone but B985 has rescheduled tonight's flow party to Thursday, August 1st. The same great deal will still be applied $29.85 for 7-11pm. See you then. Join B98.5 at the Flow House on Thursday, July 25th and party from 7-11pm. Admission to ride all night is only $29.85 thanks to the B98.5 crew. Enter to win tickets and other great prizes. We'll see you here! Due to a private party in our waterpark, stand up hours on Tuesday, July 9th will not begin till 8PM. Flow House Thundering Surf recently made the Best of South Jersey list for 2013. Best Way to Catch a Wave!! !